– 56 days until New Years! We have been using these cool Countdown Clocks for Christmas for years. Every Christmas morning it goes off at 6AM, then it immediately gets reset for 364 days and counting until next Christmas. It is a little disappointing to see over 300 days but the clock gets left on the living room bookshelf and forgotten for weeks at a time. With the exception of a few random glances over the past several months, it had recently come back into play when it hit the T minus 90 day mark. Now it gets almost daily attention as it ticks closer and closer… Did I mention there are only 50 days left until Christmas?! 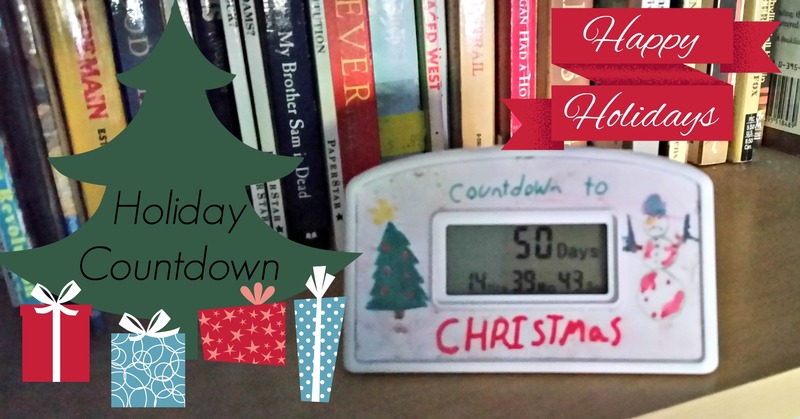 These countdown clocks only run about $10 or so, and they come in a variety of different themes, such as wedding countdown, retirement, vacation, etc. But the front face pops off pretty easily and the themed paper boarder can be flipped over or replaced with any design you can come up with… hence the “bloody machine gun snowman” my then 12-year-old drew last year for Christmas. But don’t panic! You can make the best of the next few weeks by studying one of our holiday themed unit studies! We have a Thanksgiving Unit Study that is perfect for learning the history behind the holiday. Then we have a Jan Brett Christmas unit, which is a gentle and relaxing lead up to Christmas (it even comes with a fun countdown chain you and your children can decorate and use to count down the days until Christmas morning!) as well as a Winter Holidays Around the World – which explores a variety of holidays, from Christmas and Hanukkah, to Chinese New Year and Kwanzaa. All of these units are suitable for elementary age students (with the Jan Brett unit being geared to the youngest learners) and are a steal at just $5.99 each! In the next few weeks, I’ll also be re-running our Educational Gifts series that I created last year, which will be highlighting some of our favorite educational gift ideas. And of course, our annual Black Friday/Cyber Monday sale will start on November 27 – it’s one of our biggest sales of the year, so you won’t want to miss it!